The cuisine of Peru is one of the richest and most rewarding reasons to visit South America. 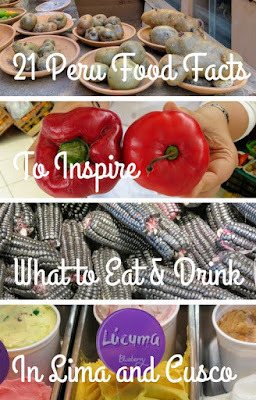 Food memories linger the longest for us and as we ate our way through the country, we discovered a surprising number of fascinating Peru food facts that still come to mind as I sit here at my computer to write this post. Read about the foods of Peru here and I'm convinced that you'll want to book yourself a trip right now to experience a food-focused visit to the heart of South America. Beware if you're hungry, you may end this session with an airplane ticket in your hand to fly from wherever you are to touchdown in Peru where you can experience the food scene of Lima and Cusco for yourself. Early on in our 3-day visit to Lima, one key food fact was drilled into our heads: the freshness of ceviche (raw fish marinated in citrus and spices) is directly correlated with the amount of time between when it was caught and when it lands in your mouth. Fishermen tend to go out early so breakfast and lunch are really the only meals to consider having ceviche. By the time dinner rolls around, the fish is just not fresh anymore. We learned from Silvia at Lima Gourmet Company that locals in Lima wouldn't dream of eating ceviche for dinner. Peru may be famous for ceviche but the country is even more famous for its signature cocktail, the pisco sour. Made from pisco (a grape based liquor akin to grappa) plus lime juice and egg whites, three drops of angostura bitters are added to garnish the cocktail. Did you know that there is an ongoing "dispute" better Peru and Chile over who invented the pisco sour and who does it better? The egg whites are the not-so-secret ingredient that differentiate a Peruvian pisco sour from a Chilean pisco sour making the lovely froth on top of the cocktail when the ingredients are shaken. I believe egg whites are the key reason that the Peruvian pisco sour is so good (and better than the Chilean version, in my opinion). Speaking of Peruvian drinks, chicha morada is another local favorite. Made from purple corn, flavored with spices you might find in mulled wine, yet served cold, many foreigners think that chicha morada contains alcohol. In fact, chicha morada is not fermented and is actually more akin to a soft drink. Chicha (Peruvian corn) is used in a variety of beverages. While chicha morada is non-alcoholic, chicha de jora (also known as Peruvian corn beer) is fermented and contains a low level of alcohol. Apparently, chicha de jora was quite important in Inca and Pre-Colombian societies and was offered to gods and ancestors in Ancient Peru. In many of the museums that we visited in Peru, we saw giant ceramic jars used for storing and transporting chicha. Inka Kola is an ubiquitous neon yellow soft drink served in Peru. It kind of looks like Mountain Dew, don't you think? Fun fact: Inka Kola tastes like bubblegum. Try it, you'll see what I mean. 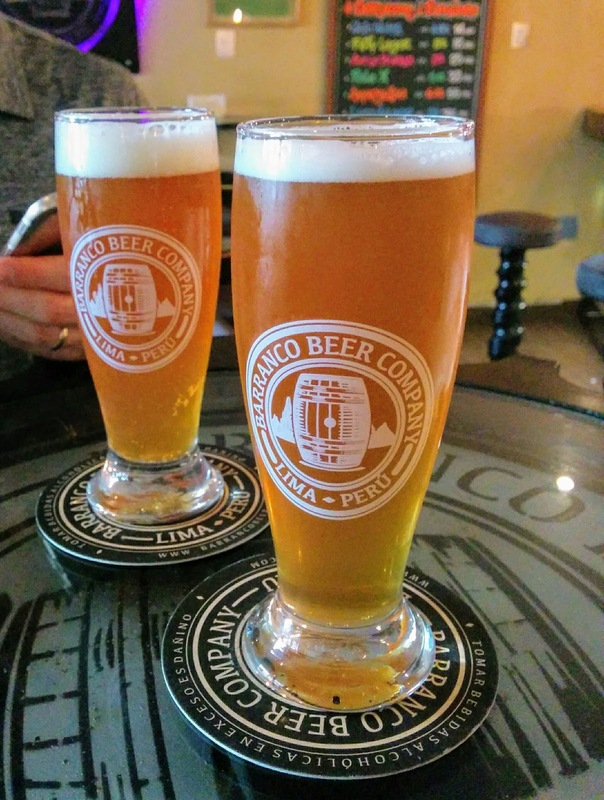 There was one thing that we quickly discovered on our visit: Peru has an up-and-coming craft beer scene. Whether we were in Lima, Cusco, or even in remote parts of the Sacred Valley like Aguas Calientes, we discovered craft breweries. Fun fact: Peru had more than 20 craft breweries at the time of writing. While on a Lima Gourmet Company food tour, we discovered lucuma. Lucuma is a fruit unique to Peru that is often used in smoothies and ice cream. The final product tastes like cookie dough! Lucuma is sometimes called the "Gold of the Incas". When the lucuma tree matures, it can produce up to 500 fruit per tree per season. No wonder lucuma was highly prized by the Incas. One Peru food fact kept cropping up again and again: Peru is known for growing over 3000 kinds of potatoes. I live in Ireland where arguably the potato has been pretty important throughout history. On the shelves of Irish supermarkets you'll find at most a handful of varieties. 3000 kinds of potatoes is a pretty impressive number. Perhaps I should head back to Peru and stay there with a personal goal of sampling all the potatoes! Rocoto peppers are a staple ingredient in Peruvian cuisine. Rocoto peppers look a lot like mild-mannered bell peppers but in reality they are extremely spicy. Beware when you sit down at a restaurant in Peru and are faced with a stuffed pepper: it's likely to pack a punch (bam!). I remembered considering what we wanted to have for dinner on a Sunday night in Lima. How about roast chicken? Pardo's Chicken, a popular rotisserie place, was just a few minutes' walk from our hotel. We soon learned that pollo a la brasa is one of the most consumed dishes in Peru. In fact, Pardo's was packed when we visited early on a Sunday evening. The juicy plate of chicken that I enjoyed at Pardo's was one of the best and most comforting meals we had in Peru. On our Lima Gourmet Company food tour, we had the opportunity to drink a cappuccino at Cafe Bisetti in the Barranco District. It was here that we learned that Peru is the biggest producer of organic coffee in the world. During our stay in the Sacred Valley of Peru, we booked ourselves in for a bean to bar chocolate-making workshop at the ChocoMuseo in Ollantaytambo. We learned during this experience that you can make tea from the husks of cacao beans so nothing goes to waste. Who knew? I love a good churro and you'll find vendors selling the deep fried pastries filled with manjarblanco, the Peruvian equivalent of dulce de leche, for just a sol. Fun fact: Peruvian churros are often made with a potato-based dough. I suppose that makes sense given how many varieties of potatoes the country produces. I wonder if there is a kind of potato especially suited to churros? I'll have to research that question in person if we ever go back to visit Peru again! I love trying bar snacks in different countries and comparing the local offering to what I'm used to at home. In Peru, pisco sours and beer are often accompanied by cancha, a salty (and very addicting!) toasted corn snack. I suppose this is less of a food fact and more of a pro-tip for your travels to Peru but I wanted to share it nonetheless. Definitely take advantage of special offers for lunch. The special plate of the day at local restaurants in Central Lima is a bargain at less than 15 sol (about $5 USD at the time of writing). If you are planning a food-focused trip to Peru, the name Gastón will quickly rise to the top of the list. Gastón is Peru's celebrity chef. We learned from Silvia on our Lima Gourmet Company food tour that Gastón originally went abroad to study law but quickly realized that cooking was his passion. He dropped out of school without telling his parents (who were footing the bill for his studies) and went on to study at Le Cordon Bleu in Paris. In fact, Gastón is so famous in Peru that an era of Peruvian food is defined by him: BG and AG (before Gastón and after Gastón). If you plan very far ahead, you can try to get a reservation at flagship Astrid y Gastón. We met a couple on our travels who were planning a trip to Lima on their way from Chile back to the U.S. just so they could have dinner here. Our plans did not solidify quickly enough so we opted to dine at Gastón's Chicha restaurant in Cusco. If you set foot outside of Lima (which is at sea level along the coast), you'll have to contend with the altitude in Peru. Cusco sits at nearly 3400 m (more than 11,000 ft) and even Machu Picchu sits at 2400 m (more than 8000 ft) above sea level. 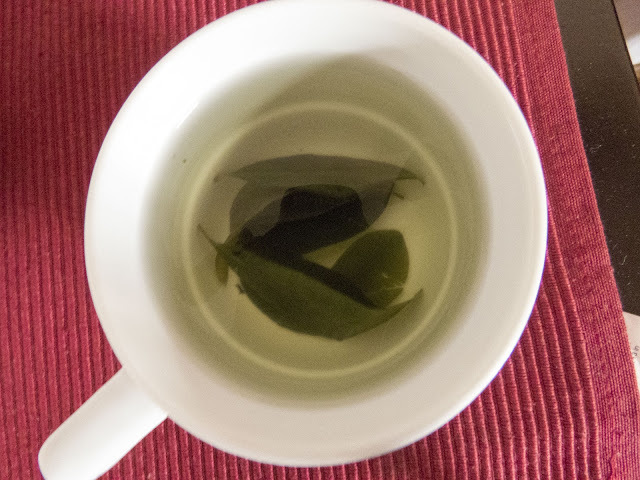 Here's a very important Peru food fact: coca tea is effective for the prevention and treatment for altitude sickness. The hotels that we stayed in in Cusco and the Sacred Valley had a pot of coca tea in the lobby to help guests acclimate. Don't be a hero: drink the tea. Another of Peru's famous foods is quinoa. Quinoa is an ancient grain but it's packed full of protein. We discovered that quinoa also makes a hearty soup. Did you know that cured alpaca can be a pizza topping in Cusco? We sampled alpaca pizza at Pachapapa. The meal was comforting and delicious. Cuy (aka guinea pig) is another popular food in Peru, especially in Cusco and the Sacred Valley. We weren't hungry enough to try it when we visited Pachapapa (although we did see the cooks preparing and basting the cuy in a wood-fired oven). Cuy is served whole and takes on a rather fierce expression by the time the cooking process is complete. Did you know that cuy is depicted as the main course in a painting of the Last Supper that hangs in the Cusco Cathedral? Photos aren't allowed so I can't post a picture here but it was fascinating to see the fusion of old-world religious concepts with new world traditions. There you have it: 21 Peru food facts! I hope you're inspired to visit one of the most interesting (and delicious!) countries in South America. What foods did you try in Peru and what did you learn about them? Share your own Peru food facts in the comments below. Learn fun Peru food facts about the things you'll find to eat and drink on vacation in Lima and Cusco. Inspire your taste buds to go on a Peruvian adventure.